VirtualBee Reviews - Legit or Scam? VirtualBee Reviews – Legit or Scam? VirtualBee is a company which specializes in outsourced data entry work by taking projects from their clients companies and distributing it amongst their online workforce, both domestically and internationally. VirtualBee is the new name and face of KeyForCash, an online data entry company that was well established in the work at home community. VirtualBee claims to be building on the solid foundation they established as KeyForCash, but with many improvements, including expanding their workforce to include international options. 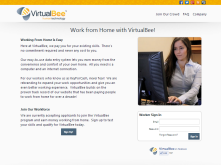 According to their website, all you need to work for VirtualBee is a home computer, an internet connection, and basic typing skills. It is free to sign up at VirtualBee, and they claim to charge no fees, at any time. If you wish to sign up as a member of VirtualBee’s online workforce, you must answer a few questions and take a short evaluation – an assessment of your abilities and skills, such as typing speed – and then you will be placed on a waiting list. Members who have higher evaluation scores will be taken from the waiting list first and presented with projects. You will be given an image of the data that needs to be entered and you just type it in. You are paid based on the quantity of work you complete, which means that the amount you earn is tied to your speed and accuracy. However, there are different rates of pay at different times for projects, so you should be aware of that. Anyone searching for an online work opportunity should ask themselves if the program or employer they are looking at is safe, or even real – there are far too many scams and unethical businesses online today. But VirtualBee is a long established online data entry company that claims to be both risk and commitment free. You never have to pay them a dime, and you are completely in control of how much and how often you work. In order to sign up at VirtualBee, you must be eighteen years of age or older, and live within the continental United States to take part in their domestic program, otherwise you may qualify for their international program. Average Rating for " VirtualBee " is 2.38 out of 5 based on 8 reviews. I have a near perfect accuracy in keyboard typing and ten-key, an assessment obtained from the Smart Business Resource Center. I believe this attributes will make me a valuable addition to VirtualBees' working force. I look forward to receiving a reply soon. You need to contact the company directly from their website. Hey buddy I m at 100 percentile can u tell me how long it takes to be hired and tell me the per hour earning. It can take months to hear back. The per hour earning depends totally on how fast you can key and whether there's steady work available. I have completed the evaluations several times over the past 2 months, I am stuck at 89%. I have practiced typing and retaken the evaluations and am still at the same percent. After reading the comments I am rather concerned that I have only been wasting my time. Eileen, chances are you won't hear anything if you can't a 100% rating. Even people who score 100% are competing with thousands of others who scored 100%, so the wait can be weeks or even months. I scored 100% and waited about 8 months before I heard anything. There is never work like they say there is. You don't get paid near enough for everything you do. seems if they find out you right a review then you get work but that is once every so often. So not worth the time. I would go somewhere where there is actually work, and you actually make some money. You get invited, but the so called work you will never see. When you do see it, it is not worth the work you put into it! Your better off going somewhere else. Never had a problem with them. But what I do suggest is most of you need to learn to spell. From what I have read in some of these complaints, you will not make it as there is spelling and street/avenue addresses as part of the work. I have always received a response from them within 24-48 hours by e-mail. Keep your chin up and be patient as you will get your turn. And before anyone says anything, I don't work for them directly. I am a 1099 as you will be. You're not supposed to correct spelling errors in the work you key, so spelling is irrelevant at Virtual Bee. THEY CAN'T EVEN SEND A LINK THT WORKS TO COMPLETE THE SIGN UP PROCESS, NOR DOES ANYONE EXIST TO SPEAK WIT ON THE PHONE FOR HELP. THIS IS A USELESS SITE AND A WASTE OF MY TIME!! I give them a 3 stare because I have yet to receive my first check. Which the cut off date was 04/03/13. Does it really take a month to cut the check and mail. My fingers are exausted and companies should not delay payment when you are providing them a service. I have worked for Key for Cash, Virtualbee for about 6 years. Never had a problem. When they clear my account on Thursday, it takes about 1 1/2 to 2 weeks. If it is a month, then you need to get hold of them. First of all, the company is completely legit. Pro's: Easy peazy work. Just log into the site and start typing the images on the screen according to the directions (for example, keying "numeric" data follows different rules than keying "dollars and cents" data). Work when you want, as much or as little as you want. Everytime you accrue $30 in your account, you get paid. It's easy to get involved, just sign up, take the test (as many times as you want) and once you get a good score (as close to 100% as possible), wait to be contacted. Con's: You will never make a living doing this stuff. It's supplemental income at best. You can expect to make a few dollars per hour if you work non-stop. There are also times when there's no work available, usually in the afternoon hours and on the weekend, when more people are awake and using the system. Mornings to early afternoons on the weekdays are the best times to find work. Also, it took about 8 months for me to get OK'ed to start working, even though I had a 100% score on the tests. Competition for this stuff is fierce.